The phenomenon of the ‘backwash effect’ whereby the format and foci of GCSE assessment has a direct influence (positive or negative depending on your point of view) on teaching practice at Key Stage 3 will be familiar to many language teachers. Some, perhaps, may have stood firm against putting linguistic carts before horses and tailoring their teaching to a particular assessment style. Others may view this as a common-sense approach to securing good outcomes for their students, departments and schools. Until recently, the high-stakes nature of GCSE outcomes and the associated progress tracking systems used in schools may have rendered this point moot. However, against the background of an announcement made in the early autumn of 2017, the recently published annual report of Her Majesty’s Chief Inspector of Education, Children’s Services and Skills (Ofsted, Dec 2017) asserts that ‘exams should exist in the service of the curriculum rather than the other way around.’ Subsequent reaction in the educational press suggests that while teachers found little to object to in this revalorisation of the curriculum, there was also a sense that Ofsted wanted to have its cake and eat it too. But is this precisely what is possible? This blog post looks at how approaches to assessment can be tailored to best meet the needs of each key stage to ensure breadth and depth in language skills development and to avoid ‘testing to destruction’. 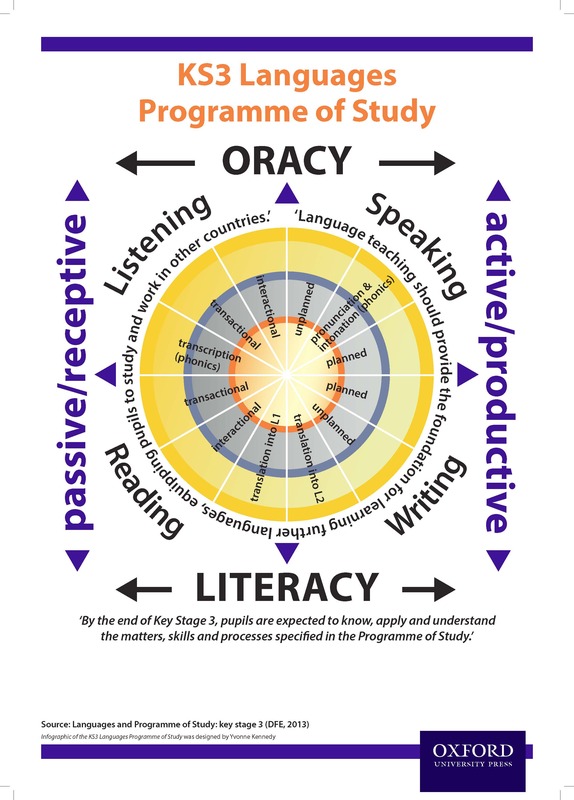 The Languages Programme of study for Key Stage 3 (2013) represented a move away from the delineation between listening, speaking, reading and writing and the creation of four discrete skill domains. The infographic below illustrates how the separate elements of the programme of study came together to form a unified, organic whole. What is emphasised here are the intrinsic and inherent links between those domains, which come together to form broader skill sets, with proficiency in both listening and speaking contributing, for example, to the development of oracy (the ability to speak and to understand spoken language). In addition to an emphasis on the interconnected (as opposed to disjunctive) nature of the four ‘traditional’ skills, a previous blogpost looked at how these domains have been nuanced by the programme of study. Divided into sub-skill sets (e.g. interactional versus transactional listening/reading), it provides a framework against which teachers can fine-tune assessment (e.g. comparing students’ ability to extract specific information from a scaffolded, highly contextualised spoken passage versus processing verbal information at relatively high-speed as a largely unsupported interlocutor). 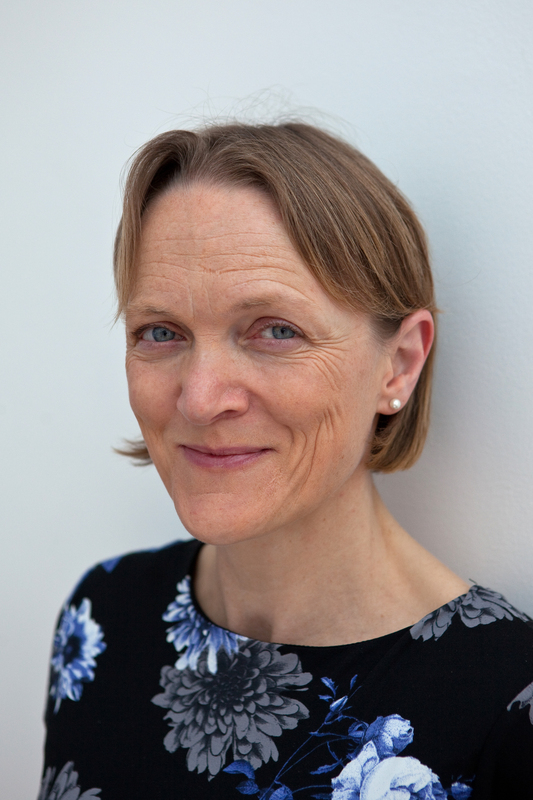 This new imperative to teach language skills in a way that emphasises their interconnected and nuanced nature (‘pupils should be taught to …’) raises the question of assessment and how teachers can evaluate the progress of their learners against the programme of study and throughout the key stage. A previous webinar discussed alternative assessment activities that could be used to reflect the creative latitude proffered by the programme of study for Key Stage 3. In addition, a new OUP framework has been developed to reflect skill interconnectivity and complexity and to allow for greater flexibility in assessment. Listening, speaking, reading and writing have been broken down into their skills subsets to allow teachers to focus on assessing and/or reporting the different aspects of those skill domains. Alternatively, teachers that prefer a more traditional approach may choose to focus on the core features of those skill domains by assessing progress against the middle column only. While remaining true to the programme of study for Key Stage 3, the OUP assessment framework also aims to provide good progression onto GCSE. For example, a focus on teaching and assessing interactional and transactional listening at Key Stage 3, develops skills needed for the role-play and general conversation in GCSE. Likewise, a focus on unplanned and planned writing will produce more confident writers in the exam. Thus, this new approach to assessment at Key Stage 3 does not so much ‘teach to the test’ but focuses on the authentic nature of linguistic interplay in a way that develops valuable skill sets for Key Stage 4. But given the importance of exam outcomes for the key stakeholders (including students, caregivers, subject leaders, teachers, senior leaders and headteachers), the desire to equip students with the metacognitive and psychological skills to cope with the intellectual and emotional demands of assessment at Key Stage 4 through formal and explicit exam practice is perhaps both understandable and necessary. Modelling the thinking processes involved (e.g. walking talking mocks) and identifying knowledge gaps and techniques yet to be mastered (e.g. question level analysis) will build student confidence as they get to grips with the new GCSE, with its more demanding content and increased emphasis on the application of knowledge. With this in mind, a set of levelled assessments has been designed to complement the wealth of assessment material provided by the Allez course. In the style of GCSE assessments, these are designed to focus on the key language of the corresponding Allez units, while recycling and interweaving high-frequency language and out-of-topic key language. This has been done to emphasise the transferability of vocabulary and structures to both build student repertoire and student resilience in making meaning throughout Key Stage 3 and to improve transition to Key Stage 4. Then sign up for the Constructive approaches to modern languages assessment for KS3 and KS4 webinar on Tuesday 23 January at 4pm. Unfortunately, I was busy on the day of the webinar. Is there a way to have access its content?